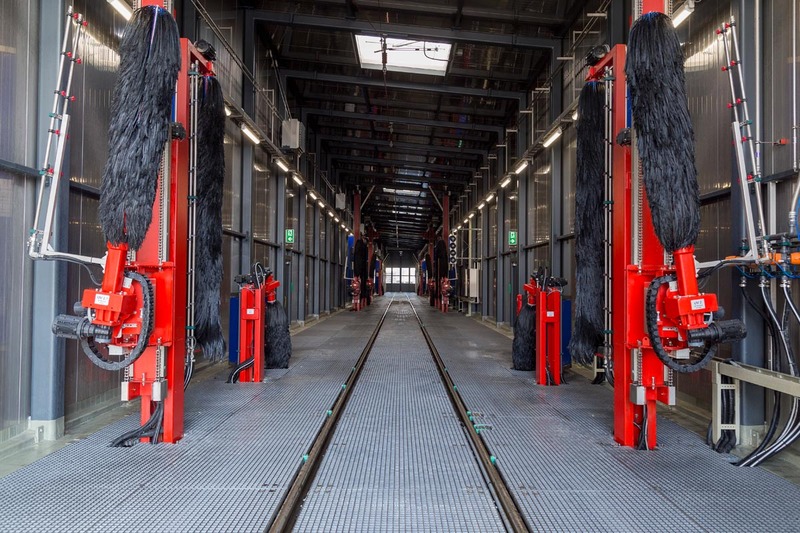 Built as two self-driving wash carriages with 1-2 side brushes and an optional front brush on each side of the rails. 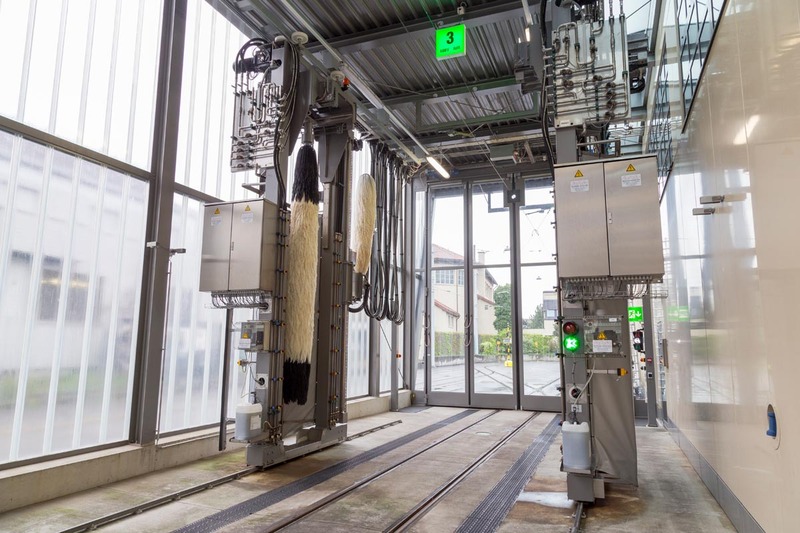 Configured for washing trains in drive-through wash halls with overhead line, or for washing trolleybuses. 3-stage telescopic system for moving the side brushes perpendicular to the track. Side brush lifting unit for raising over the buffers when washing the front. 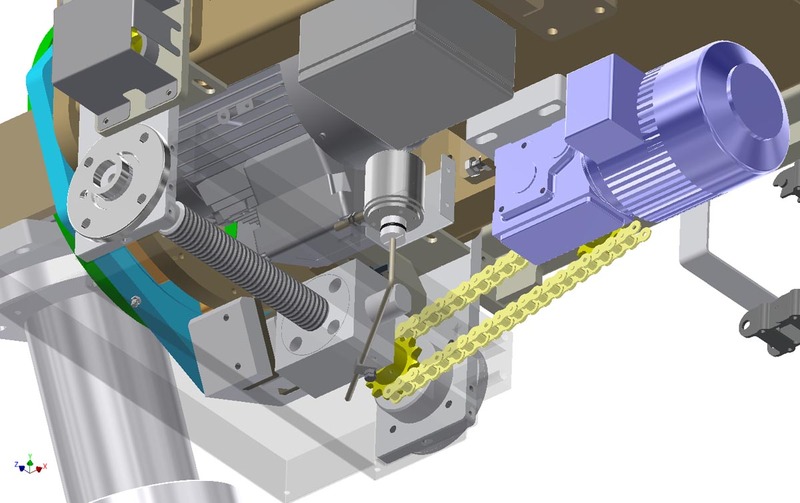 Optional side brush pivoting in track axis by up to 45°. 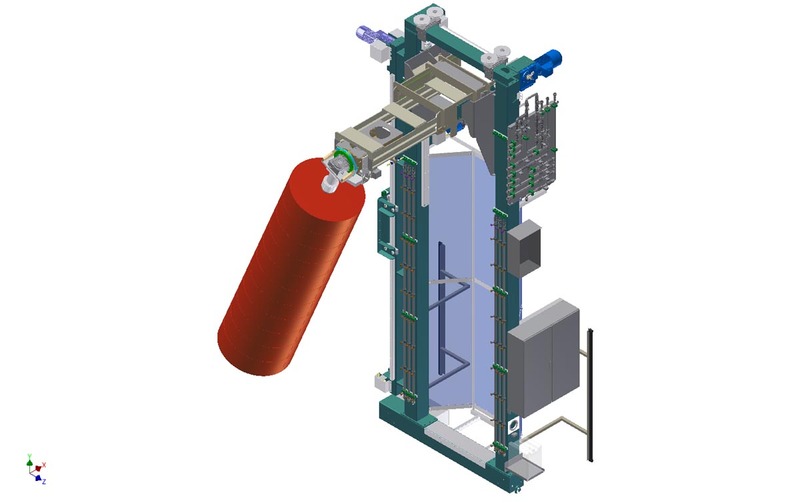 All steel parts with acid-proof C4/C5 coating, bearing and spray systems made from stainless steel. Optional attachment of front brush on separate column, height adjustable, pivotable up to 90° perpendicular to the track. Optional 3D pivot: additionally pivotable ± 30° along the track axis. 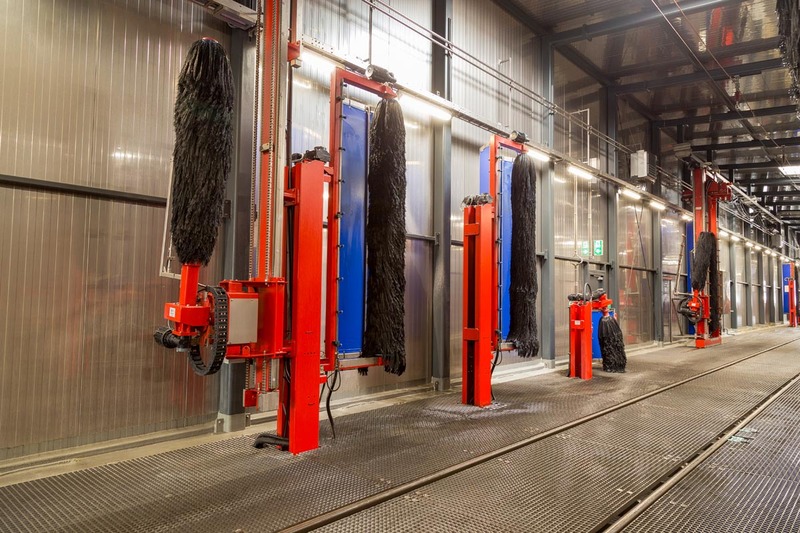 Stationary brush stations for washing the sides and (optionally) the roof and skirt areas on trains in drive-through mode. 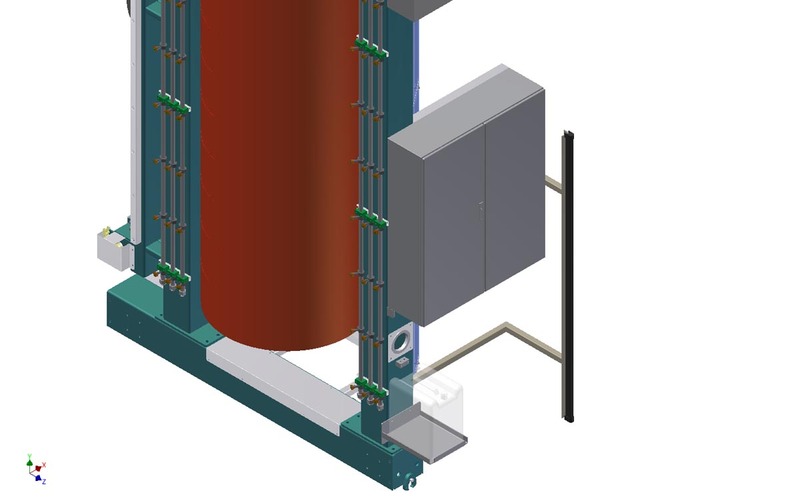 Torsion-resistant column design with base plate for ground mounting. Pivoting side brush frame with multiple bearings. Side brushes can be optionally expanded as "Pendolino" version for washing round train bodies. Control and switching elements incorporated in switching cabinet on the brush station. 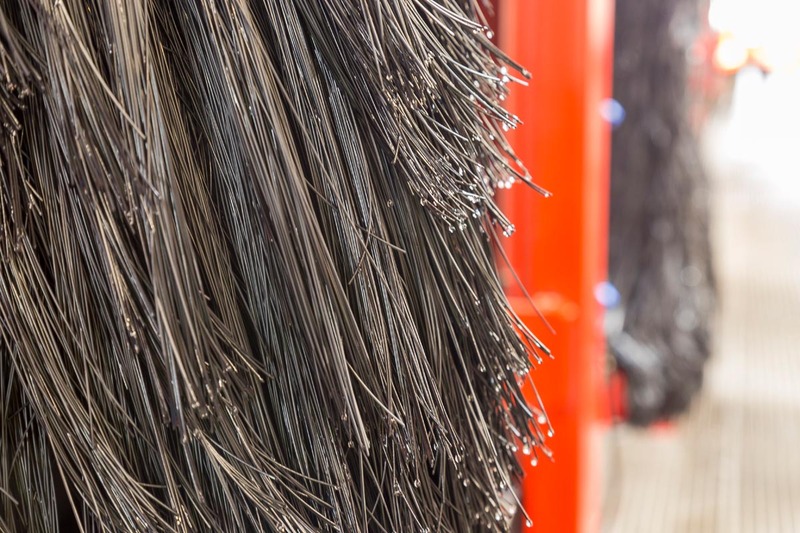 Additional roof and skirt brushes optionally available. The BHB 3D brush is the solution to guarantee a perfect wash result for today and future vehicles with streamline and curved front areas. 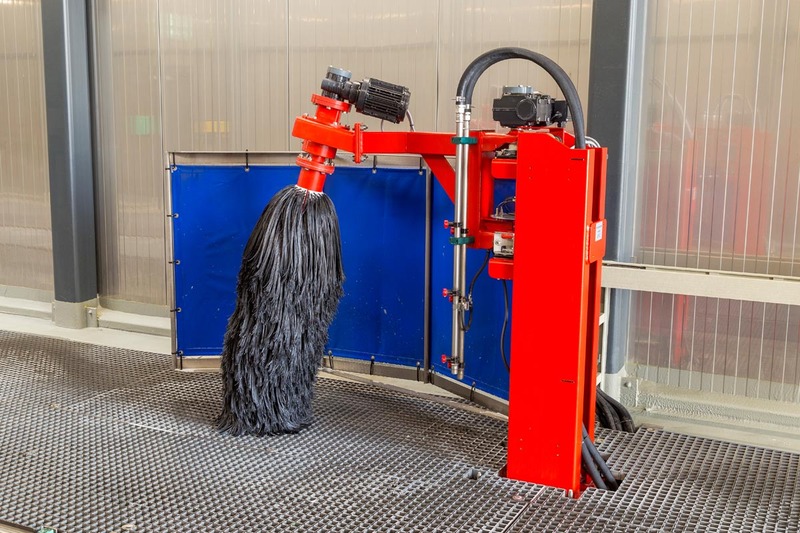 The 3D brush is movable in all 3 axles (and free controllable in horizontally and vertical pitch, as well in height direction ) to position the brush cylinder in best impact to the surface. 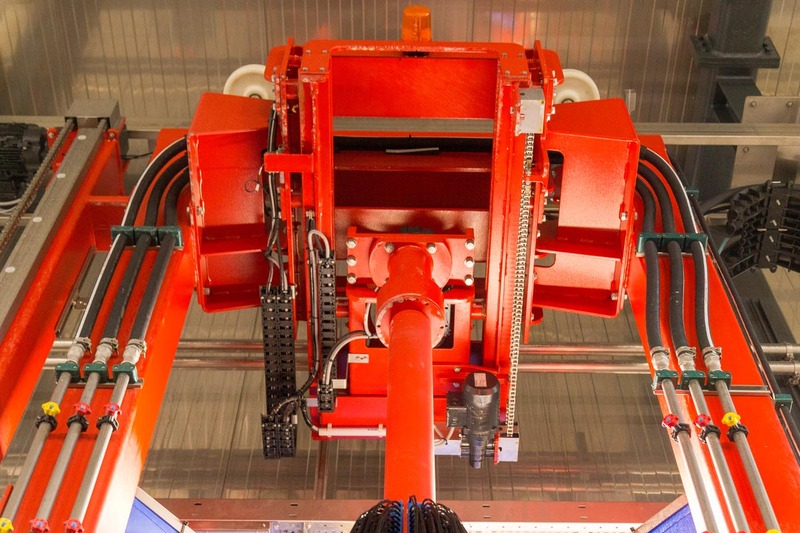 Every movement is controlled by encoders and driven by electric gear drives. 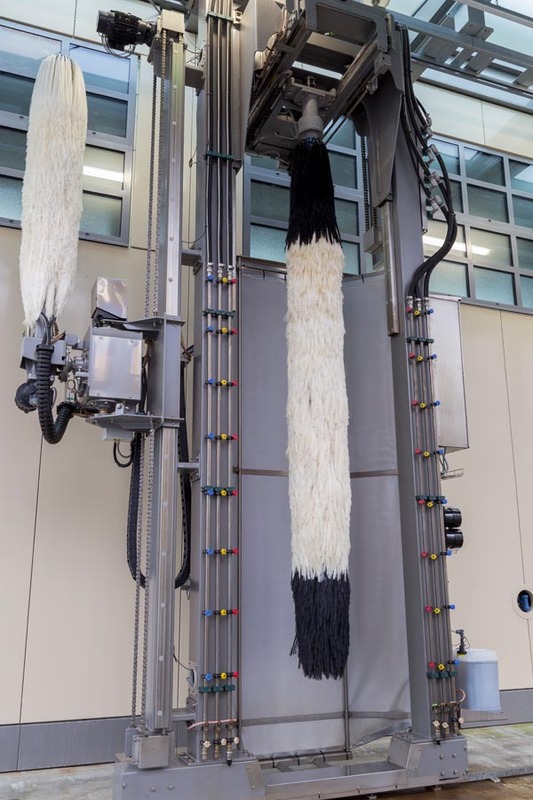 The 3D brush module is designed as add on to the BHB wash trolleys ESTW type and the BHB gantries EWR. type. The 3 D brush is guided in a sturdy frame with maintenance-free skids, the swiveling movements is taken by heavy duty flange bearings. All electric elements are high class IP protection rated, and sheltered by additional covers. 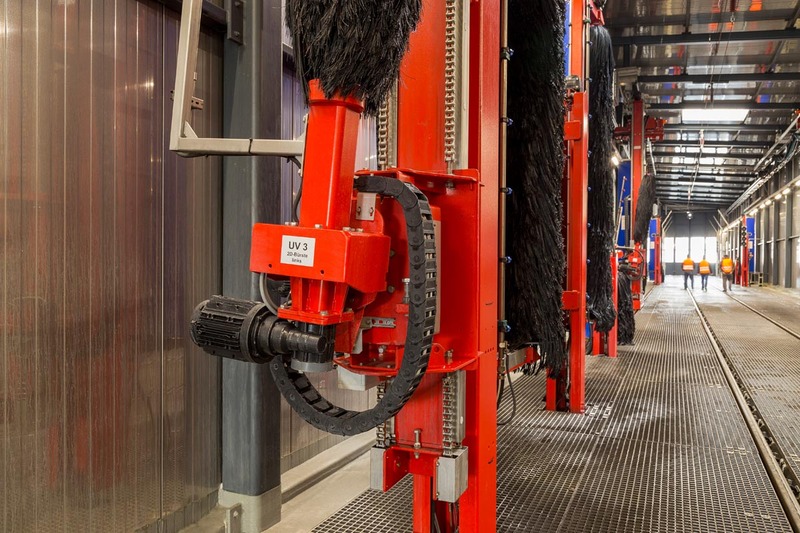 The 3 D brush module is part of the complete wash system control program. The standard PLC control is designed to be customized with add on`s, like touch panel displays, multilingual user guide and remote access. The BHB spoiler brush is the solution to clean the lower, but for the public visible, area of the front spoiler. Standard brushes are not able to cover this surface. The BHB spoiler brush is designed to be free adjustable in horizontally and vertical pitch, as well in height movement. All movements are electronically controlled, and checked by encoders, and electric gear driven. 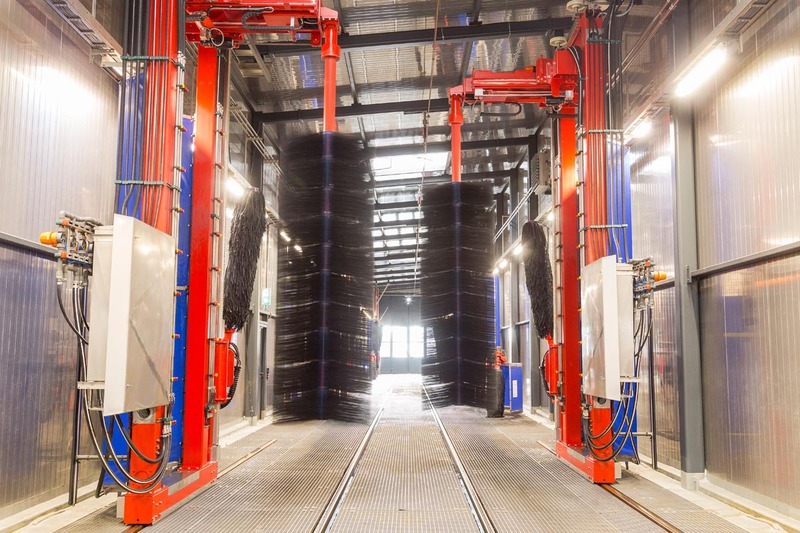 The BHB spoiler brush is designed as add on to the BHB wash trolleys ESTW type and the BHB gantries EWR. type. The BHB spoiler brush is guided in a sturdy frame with maintenance-free skids, the swiveling movements is taken by heavy duty flange bearings. 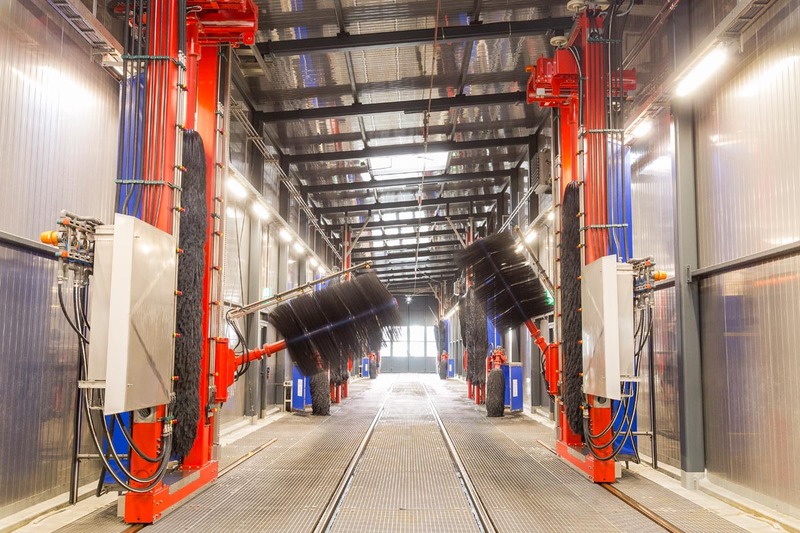 The BHB spoiler brush module is part of the complete wash system control program. The standard PLC control is designed to be customized with add on`s, like touch panel displays, multilingual user guide and remote access.